Journalist Liz Kennedy takes a look at what is making the headlines in Thursday's newspapers. There are calls for accountability from most of the local papers over our current water crisis. The Belfast Telegraph says "someone must take the blame" and the Irish News asks if "embattled" water chief executive Laurence Mackenzie can remain in post. The News Letter's editorial chronicles what it calls the "pressure" that "mounts on the NI Water boss". Its editorial notes what it calls the "desperation" felt by many householders. The Belfast Telegraph dubs it "a fiasco," but adds that upgrading the network also raises the "spectre of water charges". The Mirror's headline says simply: "We're sick of it," drawing attention to potential health risks. The Irish News editorial judges that what people find hard to excuse is the "abysmal response" to the crisis. The News Letter prints an automated email reply from Laurence Mackenzie, which seems to indicate that the NI Water boss was to be on three weeks' leave, starting on 21 December, but has now returned to Northern Ireland. The Sun has a picture of TV's Eamonn Holmes queuing to collect water. He's a "tap man for news" puns the Sun. The problems with water extend across Ireland. Irish Times figures suggest that "hundreds of thousands" will experience water restrictions into the new year on both sides of the border. There will be a temporary lifting of current night-time restrictions in the south for New Year's Eve, however. The Restaurants Association of Ireland had claimed it would be "an absolute disaster" for their business, if members were unable to open on one of their busiest trading nights. The Irish Independent reports that our cold snap is still "nothing" compared with the Great Irish Frost of 1740. Then, even "fully serviced oil lamps" were being snuffed out by the intense cold, ice floes appeared at river mouths and frozen fish were found along the shores of Lough Neagh and Strangford Lough. Otherwise, the release of the National Archives files is under scrutiny. The Daily Telegraph says that in 1980, politically, as in 2010, public finances had been left in such a state by a Labour administration, that drastic action was needed to bring them under control. The paper reports that Margaret Thatcher gave the Bank of England "a hand bagging", accusing him of undermining her economic strategy. 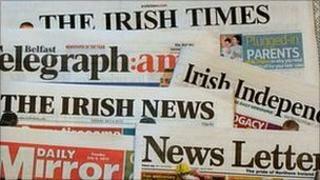 The release of state papers in the Republic is documented in the Irish Times. It pictures Margaret Thatcher with Charles Haughey showing what it calls "the scope of Haughey's efforts to gain progress in the north." The Daily Express reports that the Pope wrote to Mrs Thatcher about his "deep concern" for republican inmates on hunger strike in the Maze prison. And finally, could it be hanging by a thread? The future of the Spiderman musical may once again be in doubt. Is the superhero show heading for disaster? The Times chronicles the number of accidents there have already been, in connection with the Broadway show. It now seems that the musical, with input by U2, may lose its female lead. Producers have already spent £40m on the show and more than actors are "hanging by a thread". But previews are now packed, with New York audiences hooked on what fresh disasters may ensue. There is a silver lining to every cloud.